Ten years ago I was deeply engaged in teaching myself 3-D animation. I had downloaded a free program called Blender and within hours I was hooked. It is a truly amazing and incredibly powerful piece of software developed by a team of programmers around the world and released absolutely free. 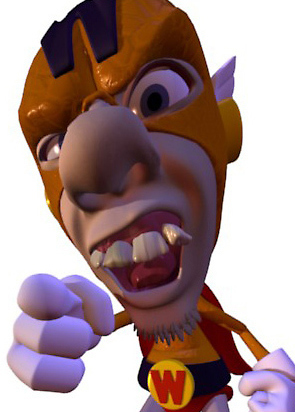 In 2007 I produced an animation featuring a hapless super hero known in Blender circles as Super Wu (or Super Wu-Man). A fellow Blender user Sacha "Sago" Goedegebure had created the original cartoon version of the character and I took his drawing, modelled it into 3-D and made the one-minute animation to the Five for Fighting song "I can't stand to fly". It was one of my earliest attempts at full-blown animation with lip-syncing. Angry Wu. Blender render by Andy Dolphin. This reminiscing may seem out of place on my art blog except that I recently saw a link on James Gurney's blog to an art website called Massive Fantastic, hosted by Eric Millen. That name instantly rung bells. Eric, also a fellow "Blenderhead" was, in fact, the inspiration for the Super Wu character. Indeed, Eric was Super Wu. This is just my long winded way of saying that if you like to look at great art, especially in the Fantasy Art genre, you should check out Massive Fantastic.